Formula A was discontinued in Canada in 1971 and the Players-backed national championship was for Formula B cars only. CASC must have been delighted with the response as the season proved highly competitive. 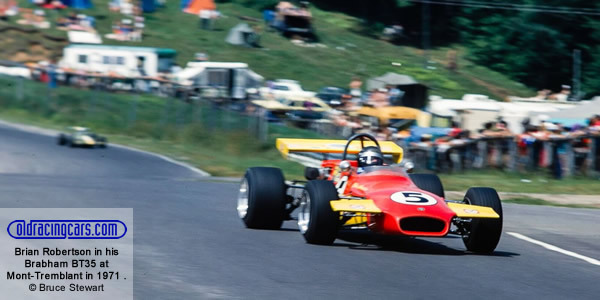 Reigning Molson Quebec regional champion Jacques Couture and teammate David McConnell had acquired new 1971 Lotus 69s, as had top national FB drivers from 1970, Craig Hill. Another top Molson runner, Brian Robertson, had a new Brabham BT35 while four of the latest March 71BMs had been imported into Canada. Gary Magwood had selected a Hawke DL6B which proved quick but unreliable. Couture, Robertson and McConnell battled for both the Players and Molson titles and Couture had the slight edge up to the Canadian GP support race Mosport Park in September where three new contenders joined the frey: Canadian Formula A star Bill Brack in a Fred Opert Brabham BT29 and two leading Americans, Alan Lader and Bull Gubelmann, both ineligible for points. The newcomers dominated the race but Couture's points for fourth place brought him close to the title. In a dramatic final round at Westwood, all three of the leading contenders refused to start because of a huge rain storm, leaving Couture as champion. A week after Westwood came the final of the Molson series at Ste Croix, Quebec, with McConnell a point ahead of Couture after beating his teammate in each of the previous two races. Again there was steady rain and again a number of leading drivers didn't start, including Couture who crashed in practice, Robertson and leading March drivers Ian Coristine and Randy Fraser. McConnell cruised to victory to take the junior title. The 1971 results were compiled by Chris Townsend using Canadian Motorsport Bulletin as his primary source. Official results sheets for many races were provided by Dominic St-Jean of Quebecois motor racing website autocourse.ca and by former competitor and now best-selling photographer Ian Coristine.